Originally these suits got their own posts but it felt appropriate to share them together. 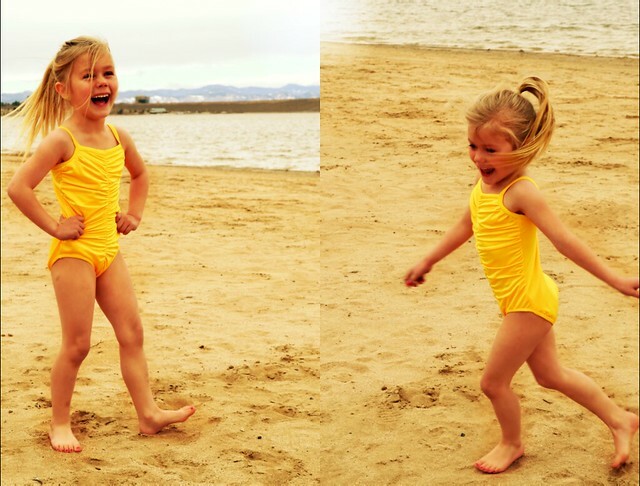 I first made this yellow swim suit for Lorelai as part of a sew a long challenge for Project Run and Play. It was my first attempt at sewing swimwear and after I discovered how easy it was I decided to tackle a sewn in bra swimsuit for my sister, Bekah. 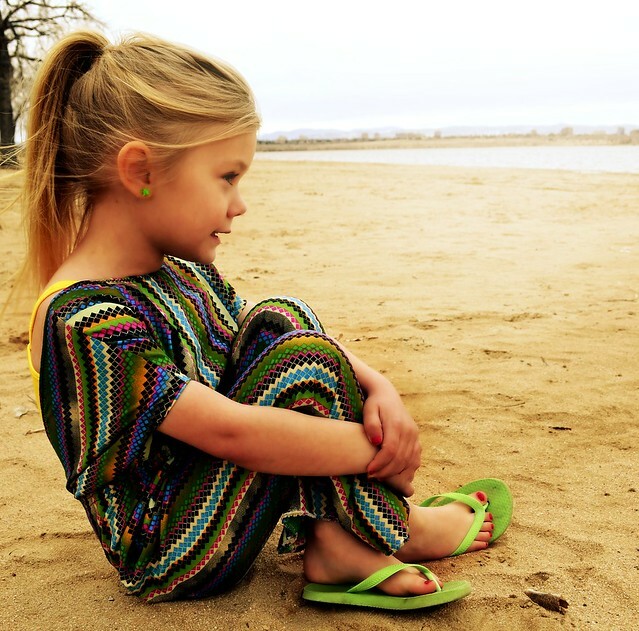 Lorelai’s adorable outfit includes a bright colorful swimsuit cover up. 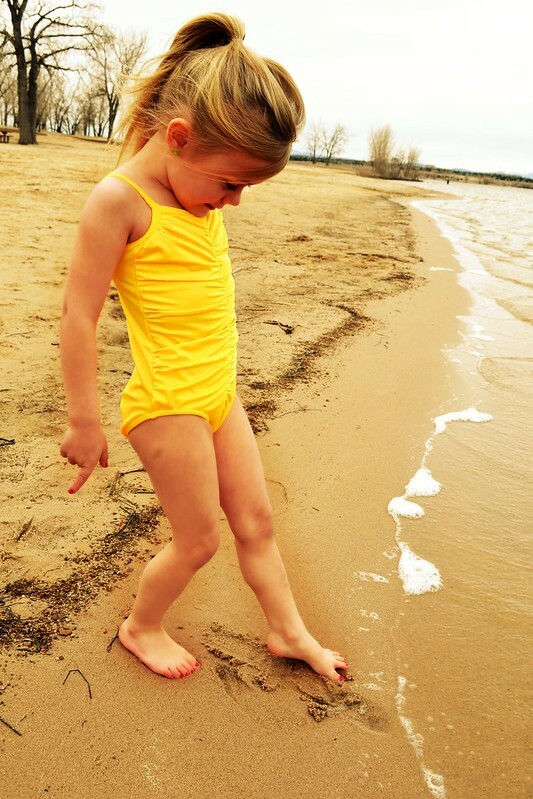 It is a one piece, pant suit that Lorelai can step into through the neck and easily slide off for some beach time fun! To make this swimsuit I heavily modified a kwik sew pattern, I can look up the number if you are interested. I turned the suit into a one piece, removed all the frills and bows and added the rushing down the front. So pretty much the pattern was just here to help me with the proportions.. for the most part anyway, I had to remove a lot of fabric from the chest area. The pattern is sized for a six year old but there was so much fabric in the chest it would have only fit her well if she had started developing as a four year old. Lorelai thought that was pretty hilarious. Now Bekah’s I sewed this swimsuit completely off the seat of my pants, I didn’t use a pattern just loosely based it on a swimsuit she already had. I started with the most intimidating part. Sewing in the cups was intimidating but actually not very difficult. Once the bra area was done I was good to go and the rest of the project went together lickety split. I finished Bekah’s swimsuit in time for her to wear it on our trip to Water World and I was so glad she was so excited for it. Just for you we got in a couple of pictures before we got to all the water slide fun! Look at this next picture. The whole time we were at the park I kept wanting to say, “I am just so proud of that bra piece!” But we were with my dad and husband and I thought that might get a bit creepy so I’ll brag here: I am just so pleased with how it turned out! Make sure and come back Monday, I’ll be participating in the Sew Pro All-Star’s Blog Hop! Have you ever sewn something you thought would be so difficult but turned out to be smooth sailing? Would you tackle swimsuit sewing?